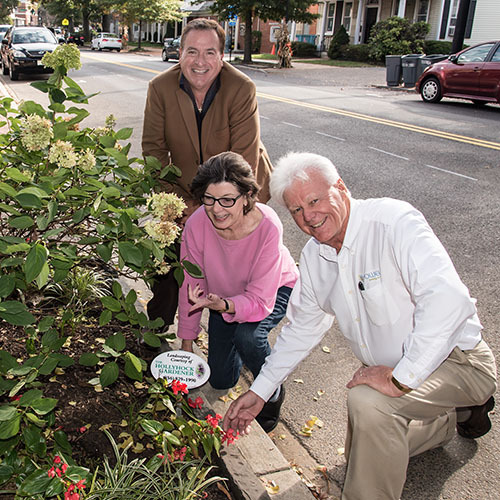 The increasing visual appeal of Moorestown’s Main Street business district is due in part to dedicated volunteers who have responded to Moorestown Business Association’s initiative to beautify the walkways that rim the town’s central corridor. Earlier this year The Hollyhock Gardener service joined the effort and targeted two planting beds in the first block of Main Street doing what they do best—careful planning and cultivating of garden areas. Choosing plants that would remain attractive as the seasons change, the team from Hollyhock donated their time, materials and expertise to create garden areas that are still appealing as winter approaches. The MBA awarded The Hollyhock Gardener a Spotlight Award in recognition of their efforts. Hollyhock Gardener owner Kay Stuckey Mufalli has been an active member of the MBA and Moorestown Rotary for years and, although her business is headquartered in Cinnaminson, most of her customers are Moorestown residents. Through her many connections in town, she and her company are committed to maintaining the township’s charm and beauty and she was eager to take on the Main Street project. Stuckey is especially proud of her dedicated team of professional gardeners who treat customer’s gardens like they were their own. Over half of her crew are women, who add a unique perspective to each endeavor. The company prides itself on grooming gardens that are environmentally friendly, not “over-planned,” and with careful attention to light and color. Stuckey’s eye for design and color was honed in her first career as a fashion buyer and director in New York. But she grew up in a farming family in South Jersey where she learned horticulture from an early age, and jumped at the opportunity to start The Hollyhock Gardener over 20 years ago. The MBA initiated its Spotlight program as a means to highlight local businesses that are making a positive impact on the community. From brightening up street-front properties, to supporting charitable causes, to providing unique services and goods for the town, the MBA wants to publicly applaud businesses that are helping to make Moorestown an outstanding place to shop, visit and live. Business owners and residents are invited to contact the MBA to share information about initiatives they have taken or businesses they know that have taken measures to improve Moorestown.